“Shoes Maketh The Man” – one of my favourite statements in recent times and true in every sense. If you’ve followed me for the past year you will know I’m fast becoming shoe obsessed and for me the starting point to almost every outfit is the footwear, particularly this time of year. With the temperature dropping and things getting a little wetter here in Blighty, it’s important you plan ahead when it comes to your outfits and especially when it comes to your footwear. We’ve all experienced that anguish and pain when walking through torrential rain in brand new suede shoes, so don’t get caught out this Winter and make sure you put some thought in before stepping out into the cold! It’s no secret that Russell & Bromley are one of my all time favourite brands for footwear and they have recently launched their Oxford Street East store, so I thought I must head over and check things out. Shopping for shoes can often be a real challenge with sizing and styles very brand specific, hence I always like to buy shoes in store and take my time trying shoes on to be sure of the fit and that they work for me. I’ve always found the Russell & Bromley staff extremely helpful and knowledgable with regards to their wide variety of designs which of course makes the whole decision making process that much simpler and experience that much more enjoyable. 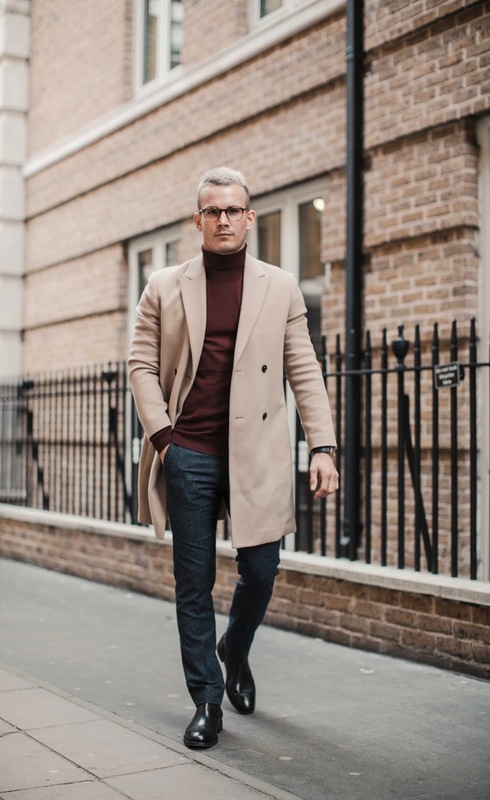 I’ve always taken a liking to boots, they are versatile, smart and casual and can be worn with jeans or trousers and during the Winter months I feel like there is no better style of footwear. When picking your boots it’s always good to think through the scenarios in which you’ll wear them, how often and what with, to be sure they are a worthy investment. Quite possibly my favourite shoe this season! The leather lace-up is the ultimate shoe for Winter, hardwearing and weatherproof whilst maintaining that style. This particular pair, the Walnut, comes in three colours, olive, black and this lighter tan and is styled with a brogue detailing. These boots are ideal for those rainy days and with a rubber heel and sole they are comfortable on even the wettest of pavements. I like to style this with tight fitting, darker jeans or for a more casual look a lighter pair with a ‘turn up’ for some additional detail. A shoe for all weather and every scenario, it’s a worthy addition to your footwear armoury. Shop the Walnut here. There’s something stand-out about blue suede shoes. Personally there’s no better colour tone to compliment jeans for that smarter look and I love pairing these with a similar coloured jean to an all over dark navy vibe. This pair are the Burlington design and an absolute favourite (I must have almost every colour at this point!). A classic Chelsea boot structure with a thicker soul and rounded front, they are an ideal all-rounder for both smart and casual occasions. I’ll be wearing these with both jeans and tailored trousers this Winter and they are the first pair of shoes I’ll be putting in my Weekend bag due to their versatility. Quick tip if you are considering investing, be sure to pick up some suede protector and spray 30 minutes before every ‘journey’, this will keep them looking smart and slick for as long as possible! A shoe thats perfect for party season , check them out online here. The final pair I picked out from the new store are a classic in men’s footwear. This all black leather Chelsea boot is a timeless shoe and a boot for those smarter engagements. Once again in the Burlington design, this is a Chelsea boot for the modern day gent with a rounded toe and is constructed from black calf leather for a sleek finish. I’ll be wearing these on those more dressed up occasions primarily coupled with tailored trousers or chinos. They are a great investment in time for the festive season and I like to give them a decent shine up before heading out for the night ahead! An iconic boot that every twenty first century gent should have in the closet. Check them out online here. I’ll be taking these three pairs for a spin over the Weekend so stay tuned for three Winter looks featuring the boots, live on Man About Town on Sunday. Which are your favourite of the three? What shoes will you be wearing the most this Winter? Next Post What Makes The Modern Gentleman?